The Salford Red Devils Foundation hosted the Salford Champion School Finals at the AJ Bell Stadium, as teams from 4 schools competed across 5 age groups to be crowned as champions of the historic competition. The finals, played across two days saw an extremely high standard of rugby league played with enthusiasm as the schools battled it out for local bragging rights. The first day of the finals was opened by year 8 as St Ambrose Barlow High School and Buile Hill School came head to head. The teams played out a thrilling final, with St Ambrose Barlow coming out 20-18 winners to win the Chromal Plating Shield. This high paced encounter was followed by another as Buile Hill faced Walkden High School in the year 9 final, but it was to be heartbreak again for Buile Hill, as Walkden proved to be to strong, winning 34-10. It was third time lucky for Buile Hill as their year 10 team opened up the second day of games with a fantastic 20-12 victory over Wright Robinson School. In an extremely tight contest, Wright Robinson took the lead into the half time break, but a fantastic second half effort saw Buile Hill run out as eventual winners. Next up was year 7, and Wright Robinson were not to be denied a second time as they recorded a 16-6 victory over Walkden High School to win the Salford Schools Sports Federation Shield. 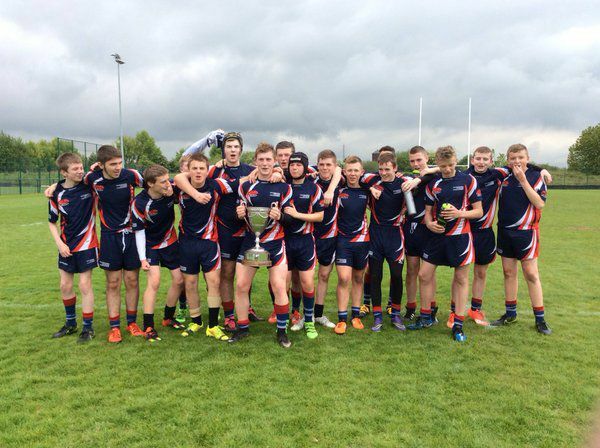 That left year 11 to play the last game of the finals, which saw Wright Robinson win their second trophy with a convincing 32-6 victory over St Ambrose Barlow.